Leighton as Blair. Great blazer! Warner Bros. photo. I have been watching re-runs of Gossip Girl here and there when I need some outfit, makeup, or jewelry inspiration. Those were some skilled and creative people behind the scenes of that show and I find a lot of those looks—and particularly the jewelry—still relevant today! I didn’t watch Gossip Girl back when it aired regularly since I had a baby and kindergartner at the time, was exhausted, and had no time for TV. Leighton Meester and Penn Badgley film Gossip Girl. Warner Bros. photo. Leighton and her good luck shoes. Photo by Filmmagic. 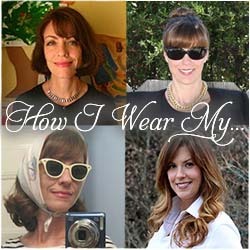 Whether you have a great story like Leighton’s about a lucky pair of shoes or just a special thing you love to wear, consider this your friendly reminder that March’s “How I Wear My” is all about the Lucky Charm! Send photos to us at howiwearmy@yahoo.com by March 6, 2017. Be sure to include a description of your outfit, which we will use directly in our posts. OH i like this - i must go through my stuff bc i have a few of these things! One common task for marketers is resizing images to fit a blog post or another medium. While practically all of the image editors alternativephotographyinc.com in our list let you do this, if all you need to do is change the size of the image, a simpler tool might be enough. Here are three to choose from.